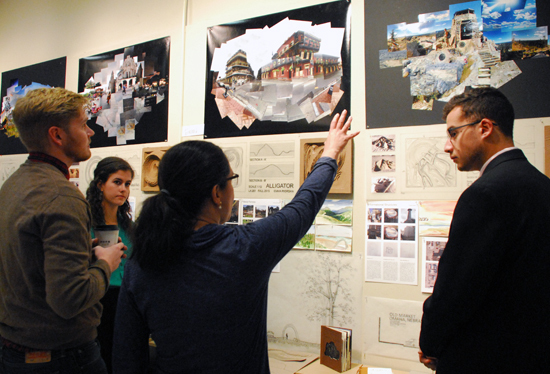 All incoming undergraduate students complete the college’s first-year Core Design Program, then apply for admission to the four-year professional Bachelor of Landscape Architecture (BLA) degree program. The professional BLA curriculum is studio based. Studios are workshop-like classes where you apply the information gained in classes to practice and project development. Studios take place every semester and typically meet for four hours each, two or three days per week. During studio, you will have time to work on projects and interact one-on-one with your professor. A number of other classes are lecture/lab-oriented where specific technical knowledge is developed. Examples include LA 282: Landscape Dynamics and Design, and LA 481: Landscape Construction. Students also have university general education requirements, landscape architecture professional electives and free electives. Course descriptions are available online in the university catalog.